As pitchers and catchers start to REPORT to Spring Training facilities in Arizona and Florida, we have our first BIG story line on the HYPE of the Yankees’ 2018 season. Most experts are picking the Yankees to WIN if not AT LEAST get to the World Series this season and apparently Justin Verlander is really SOFT and BOTHERED by it. Verlander has played for the Astros for like TWO months so maybe he should stop talking. I actually completely agree with him but there is NO reason to get some bulletin board material on the FIRST day of Spring Training. IF the Yankees do in fact beat the Astros in the Postseason then this tweet will come around to BITE him. The Yankees have very HIGH expectations and most fans are way too HYPED for this season but the Astros did WIN the World Series last season and they RETAINED most of their roster and made some MAJOR upgrades to their pitching staff. The Astros and the Yankees are the TWO best teams in the American League and they are going to FIGHT till the end for the AL crown, it is going to come down to which teams HOSTS Game SEVEN of the ALCS this time around. 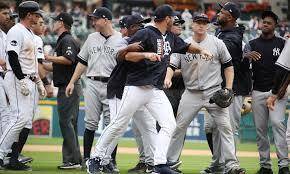 Verlander was GREAT against the Yankees in the ALCS last season, god I really hope that he gets SHELLED by them this season. We are going to get a TON of story lines between these TWO teams for the rest of Spring Training because BOTH teams are basically IDENTICAL except for the fact that the Astros won the World Series last year. I am really EXCITED for baseball season to start over the next month with Spring Training games starting in LESS than TEN (!!!) days. Come back here throughout Spring Training for ANY news that breaks in Yankees camp. I sense a new rivalry in the making. Going to be a fun 2018.